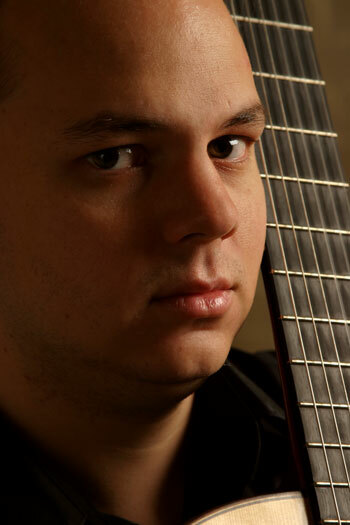 A finalist and semi-finalist in several national and international competitions, most notably, the Rantucci International Guitar Competition, the Music Teachers National Association Solo Competition and the National Solo Competition of the American String Teachers Association, David Solis Olson has performed to enthusiastic audience acclaim and is considered among the finest American classical guitarists of his generation. Noted for his beautiful sound (Phillip Ying, Ying Quartet) and clarity of melodic lines (Classical Guitar News, UK), Mr. Olson has appeared as solo and chamber recitalist in concerts and festivals throughout the United States and in Canada, France and Germany. He has performed at Saint Patrick’s Cathedral in New York City and in Eastman Theater in Rochester, New York. Mr. Olson began guitar study at age twelve and has been the recipient of numerous scholarships and accolades. These include: the Performer’s Certificate and the George Eastman Merit Scholarship from the Eastman School of Music; the John G. Welch Scholarship for demonstration of unusual talent and self-discipline and the Chancellor’s Award of Excellence from the University of North Carolina School of the Arts in Winston-Salem. Mr. Olson has performed in masterclasses for such classical guitar luminaries as Roland Dyens, Angel Romero, Manuel Barrueco and David Russell and his primary teachers include Nicholas Goluses, Ricardo Cobo and James Ryan. As an advocate for innovative and diverse solo and ensemble programming for the classical guitar, Mr. Olson’s recitals feature repertoire ranging in style and character from Bach lute works to Argentinean tangos. Past recitals have included Lou Harrison’s Serenade for guitar and percussion and Mr. Olson’s own transcriptions of Chick Corea’s Children’s Songs for solo piano. Mr. Olson has opened for rock guitarist Steve Vai. In late 2006, Mr. Olson self-produced and released his debut CD, entitled Sketches of Latin America. A colorful and varied collection of twentieth-century solo guitar works by Agustín Barrios, Leo Brouwer, Antonio Lauro, Astor Piazzolla and Manuel Ponce, Sketches of Latin America is distributed internationally through CD Baby and is available through Spotify, Amazon.com and Apple’s iTunes, among other major online media outlets. Mr. Olson currently resides in the Charlotte, North Carolina area, where he has performed with the Charlotte Symphony Orchestra and has served as adjunct instructor at Davidson College. Mr. Olson maintains an active performing career as an instructor, free-lance musician, solo recitalist and chamber player. This page was last modified on 23 July 2013.